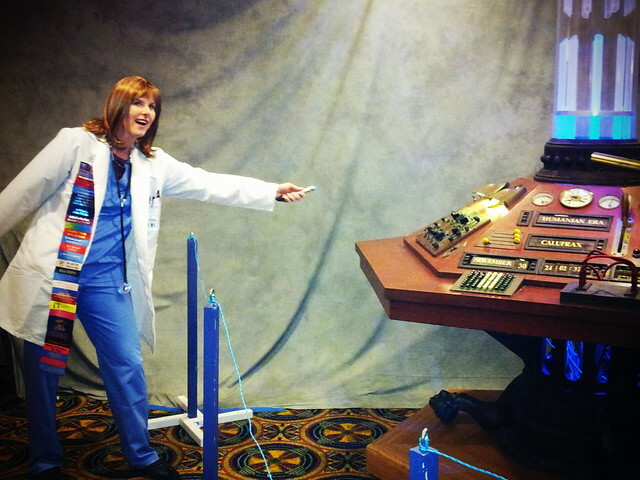 Yesterday, the final leg of Gallifrey One had arrived. It is usually a sad day with a lot of sleep deprived zombies roaming the con halls, but also a day of excitement and the need to see and do everything one last time. The day began with what I have started to refer to as Starbucks con, the morning ritual of waiting in line for coffee. This includes everyone, from con guests to con staff to con attendees. But it seems something that we all must attend. Once caffeinated, though, things get livelier and the costumes come out. I chose a Doctor Grace Holloway costume for the final day, which obviously pleased Daphne Ashbrook when I had a chance to speak with her again. For me, most of the morning was spent roaming the halls, having photos taken of and with other cosplayers. It was also time to do the annual con shopping, which resulted in purchases of a tribble, a poison ring, an art print (cats as the 11 Doctors!) and a tee that states “Captain Jack Harkness never slept here.” And as always, I hadn’t planned on buying anything. I also had a quick talk with Nerdist himself, Chris Hardwick. I once applied for a web design position for the Nerdist website, but he ended up hiring a friend. So I made a point of thanking him, because I decided to start my own blog (this one), which led to me becoming a movie critic for my local newspaper, as well as got me a feature writing position for SyFy’s DVICE.com. He laughed and shook my hand and congratulated me. I gave him a “My Doctor goes up to 11” ribbon that also had this blog’s URL on it and went on my merry way. In retrospect, I hope I didn’t come across as snarky, but light-hearted about it. He seemed to get that. I spent two hours guarding the doors of the dealers room, which also turned out to be a great opportunity to meet even more people and to hand out the rest of my ribbons. I also managed to collect enough ribbond to almost reach the floor this year. This is far superior to last year’s collection of just 5. Just before closing ceremonies, I had a photo session booked with Paul McGann. He did the “Doctor” bit, to which I replied “Doctor” and then I just felt awkward. But he threw an arm around me, as I tried to remember to breathe and I now have a photo that should appear on AwkwardFamilyPhotos.com. We both have the exact expression on our faces and no, this photo will never see the light of day. But it’s still a great memory for me. Closing ceremonies are always sad, but exciting, especially looking forward to next year’s con, which will mark the 50th anniversary of Doctor Who. It is sure to be epic. And I hope to be there. And for those who experienced it, how amazing was Simon Fisher Becker when he delivered his monologue from last season’s final Doctor Who episode? I got goosebumps! To all the amazing people I met this year, and those I saw again, I love you all. It’s only once a year that I get to hang out with 3000+ of my BFF’s, but it carries me through until the next con. See you next year!